We proudly launch The Promise of Our Common Future, the $2,500,000 campaign for SUNY Schenectady that invests in our community by investing in our students. With your support, we can enable their success and the growth of the Capital Region. At SUNY Schenectady we are passionate about people. Key to our community’s future is a college that provides a support system that helps our students make the leap from high school to the workplace and four-year colleges. A college that transforms students from jobs into careers, from entry level positions to management, from one industry to another, and from economic instability to financial independence. Many SUNY Schenectady students cannot launch or complete their education when life is complicated by worries about jobs, family, food, security or housing. They simply don’t have the bandwidth to focus on their studies. SUNY SCHENECTADY'S TUITION IS THE SECOND MOST AFFORDABLE IN THE STATE, BUT THE HARD COST OF EDUCATION IS STILL THE #1 BARRIER TO POTENTIAL STUDENTS' ENROLLMENT AND TO THEIR ABILITY TO COMPLETE THEIR PROGRAM OF STUDY. Since our students rarely meet eligibility requirements that favor traditional four-year residential college students, fewer than 100 SUNY Schenectady students received New York’s Excelsior scholarships. State funding for SUNY Schenectady is directly linked to graduation and retention rates making student success urgent and imperative. Scholarships are a huge part of that equation. SUNY Schenectady has also been awarded a Title III federal grant and has the opportunity to leverage $200,000 in matching funds for endowed scholarship gifts. Your investment in the Campaign will remove barriers and help students reach new heights. The Campaign will increase existing endowments, and create new endowed scholarships - including the Promise Fund - that will provide funding for more scholarships each and every year. Your legacy will endure forever by transforming lives in perpetuity. When our students and faculty leave their classrooms today, they still face academic barriers that can keep them from achieving transformational success. SUNY Schenectady’s lacks the multi-media tools students need to research and collaborate with their peers. Learning services are scattered across the campus and students must go to different buildings to access tutoring and labs for math and writing help. 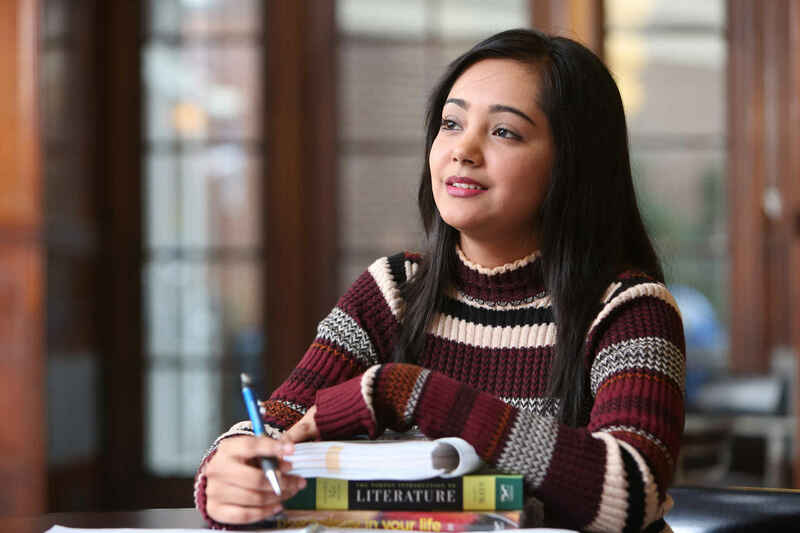 At SUNY Schenectady, there are no quiet rooms where students can write or prepare for an exam. There are no group study rooms where teams of students can collaborate on a project, and no spaces to practice giving presentations using the technology found in today’s workplace. THE NEW LEARNING COMMONS WILL MEAN HIGHER LEVELS OF SUCCESS FOR OUR STUDENTS WITH MATH, WRITING, AND ACCOUNTING LABS AND A TUTORING CENTER. IT WILL ALSO HOUSE THE ONLY ROOMS ON CAMPUS SPECIALLY DESIGNED FOR GROUP STUDY AND PROJECTS. The Promise of Our Common Future will fund the renovation of the 1st and 2nd floors of the Begley Building to create the Learning Commons, a space where students can learn outside the classroom and where students and faculty can get the support they need to succeed. In the Learning Commons students will have access to a comprehensive Learning Center that houses labs for math, writing, and accounting, a Tutoring Center, meeting rooms for collaboration with peers, and a small café. The renovated 2nd floor will feature consolidated stacks and a reading area surrounded by offices, quiet study rooms, and group study spaces. Your investment in the Campaign will give faculty access to a new Center for Excellence in Teaching in the new Learning Commons. Called for in our strategic plan, the Center will focus on improving teaching practices and developing new pedagogies that enhance student learning. SUNY Schenectady’s Board of Trustees approved the creation of the Learning Commons as part of our facilities master plan. While the county and state will each fund 50% of the construction costs, private donations will fund everything inside—from technology to the resources available at the math and writing lab. The Promise of Our Common Future will help break the cycle of systemic poverty that forces some students to the food pantry and forces others to choose between basic necessities and tuition. The Promise of Our Common Future will help overcome barriers to entry for students when typical financial aid packages don’t meet their actual financial needs. The Promise of Our Common Future will ensure every step a SUNY Schenectady student takes after graduation is a step toward their future. We donated in support of the new Learning Commons! I donated to this campaign with a gift to "Christian Rohr's Passion for Cooking Scholarship". In Loving Memory of Caroline MotherJudge Isachsen with much love and appreciation from her Grey Fox Family. On behalf of the Bluegrass for the Next Generation Program at SUNY Plattsburgh. Thank you Caroline for blessing us with your limitless talent and kindness. You and Sten were wonderful neighbors and you will both be in my prayers. We donated in support of SUNY Schenectady.